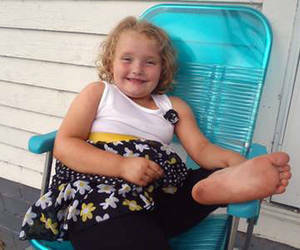 Honey Boo Boo Cast Salary - “Honey Boo Boo” family’s salary revealed. When seven-year-old Alana Thompson first uttered, “A dollar makes me holler, Honey Boo Boo,” she probably had no idea that it would not only become her catchphrase, but it would also score her and her family a reality series … and some money. Sources estimate their TLC reality series, “Here Comes Honey Boo Boo,” has earned Alana and her family a salary in the tens of thousands. The Hollywood Reporter claims that the “Honey Boo Boo” family earns between $2,000 and $4,000 per episode, possibly hitting $40,000 for the 10-episode season, according to sources. THR adds that a small “location fee” might also be paid. UPDATE: June Shannon, the matriarch of the “Honey Boo Boo” family, spoke with TMZ and “laughed out loud” at THR’s report. Though she wouldn’t be specific, TMZ claims it was clear the family makes far more than $2,000 to $4,000 per episode. No doubt, there is a possibility that this salary might get a bump if “Here Comes Honey Boo Boo” is picked up for a second season. “Here Comes Honey Boo Boo” has had huge ratings thus far and even scored more viewers among adults 18-49 than the Republican National Convention. The Aug. 29 episode drew nearly 3 million viewers. TLC has been rumored to pay big salaries to the casts of their biggest shows. Although networks typically do not disclose the deals made with individual families, details about TLC’s reality stars’ salaries have surfaced. Jon and Kate Gosselin of TLC’s “Jon & Kate Plus 8,” which first aired in 2007, earned $22,500 per episode, Jon told Larry King during an interview with CNN in 2009. The Duggars of “18 Kids and Counting” are believed to have raked in even more. Reality families usually make a salary 10 percent of a show’s per-episode budget, reality producer Terence Michael told E! News back in 2009. He estimated TLC budgeted about $250,000 to $400,000 per episode, which would mean the Duggars earned between $25,000 and $40,000 for four or five days’ work. Now TLC has a new family to cater to. The family has captured the attention of America’s viewers. However, the family has not gotten used to “Honey Boo Boo” fame. Copyright (c) 2011 24 City News.